Bottom ash is formed on thermal power stations at combined hydro-disposal of ashes and slag in the process of coal combustion in dusty condition. They are used as a component for construction matrices, heavy, light, cell concretes for precast and monolithic concrete constrictions and goods. 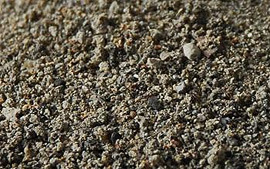 Bottom ashes is also used as a by-product soil for embankment erection of the road bed of categories II–V, category II-V of the climatic zone (according to GOST 15150) at the condition of feasibility analisys. LLC EKO-Zoloproduct sells bottom ash from Ryazanskaya GRES and Novocherkasskaya GRES. The products conform to specifications TU 5712-004-84800065-2010 «Bottom ash of thermal power stations». Certificate of conformity.